I was contacted over the weekend by some lovely ladies about “TEAlightful“. Their e-mail touched me that all the proceeds go to both George Brown College Scholarships and the Nanny Angel Network. I love it when people give back to those around them. You must be wondering what is planned during the event. First of there are two sessions : 10am till 12:30pm and 1:30pm till 4pm. Attendees have a wide arrange of things to check out! 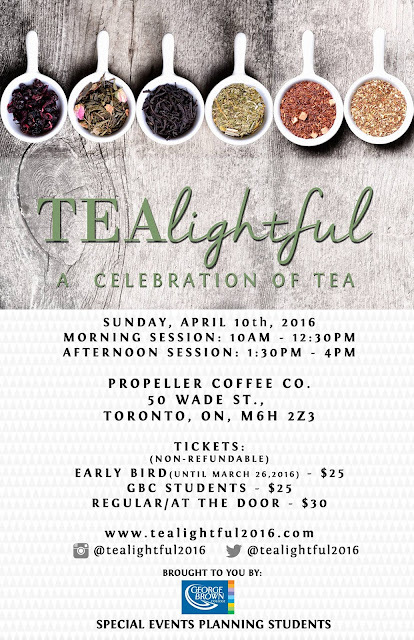 There will be plenty of tea and food samples, but also some workshops, tea leaf readings, photo booth, live entertainment, raffle and more. This group responsible for this fun filled are in their last year of the George Brown College Special Events Planning Program. Props to these lovely ladies and their selfless efforts to promote tea through their final project! I put together this post to promote their event as I believe in their cause and also wanted to support them as a George Brown College Alumni. Much love ladies and to all who attend this event. For more information check out their website TEAlightful , twitter or instagram.